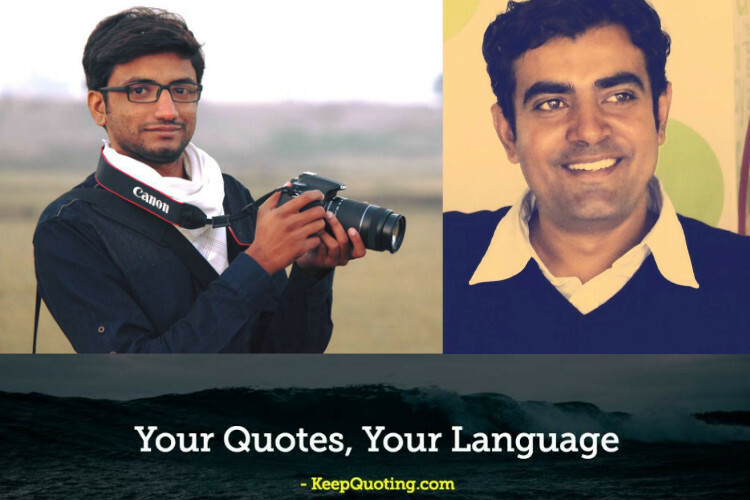 Keepquoting is a self publishing platform for the people to post their quotes in their own language in more than 600 categories and prepare an archive of their thoughts/ ideas and views. Since the start-up had technical people in the team hence, there was not much of an issue in setting up and as far as the scale is concerned, they are getting that done organically and if needed they will push for marketing efforts in the coming period. Almost every day, the founders use to come across various quote sites with the same kind of content with nothing new in that. Keepquoting believes that quotes can come to anyone’s mind and there should be a platform which lets them post their quotes in beautiful and most simplistic manner with most language support and thereby creating a local user generated content. Keepquoting does not have team yet. The founders shared that once while gossiping, Vivek shared his idea with Hardik about the site .Being a technical person Hardik agreed to build the platform as there are hardly any platform that let the people to post their quotes in their own preferred language. It took around 9 months for them to build the platform the way they wanted it to be in terms of code, structure or design. Vivek, 35 is the cofounder of India’s 1st tribute portal Shrahdanjali.com and carries 10 years of experience in training and business development. Hardik, 24 is masters of computers and works as an IT consultant. The site is new and the team has not added any revenue stream into it. Once there is significant content and user base, the revenue stream will be added, shared one of the founder. They have no revenue model so far but very soon they may come up with some, but not at the cost of user experience. In terms of funds, they are bootstrapped. One can be a user with a single click and start posting quotes in the preferred language and category. Once posted, the quotes can be shared across social media and can be downloaded as wallpaper with different look every time. In Future, Keepquoting is planning to grow global user base and create robust content. In the first week of the launch they have crossed 200 users. Read more about Indian Startups.